The system is a combined detection and extinguishing system. 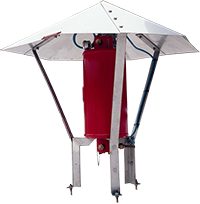 It consists of stainless steel circular piping with glass bulb detectors/sprayers installed in the rim seal area on the floating roof pontoon of the storage tank.In case of a fire, heat will cause one or more glass bulb detectors/sprayers to open and the CFI extinguishing gas is released by the detector/sprayer directly into the fire. The CFI storage container is equipped with a pressure & level switch, which will send an alarm signal to the control panel once the CFI has been released from the container.